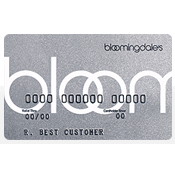 Earn 3 rewards points for every $1 spent on Bloomingdale's merchandise. Earn 6 points for every $1 spent on shoes, cosmetics, and fragrances at Bloomingdale's locations. Earn 2 points for every $1 spent everywhere else. 24.50%. This APR will vary with the market based on the Prime Rate.